Round Halo Infinity Wedding Set with Round Traditional Sapphire and Diamond | Shane Co. Fit for royalty, this dazzling wedding set features a double halo that will hold the center 1.00 round diamond of your choice. 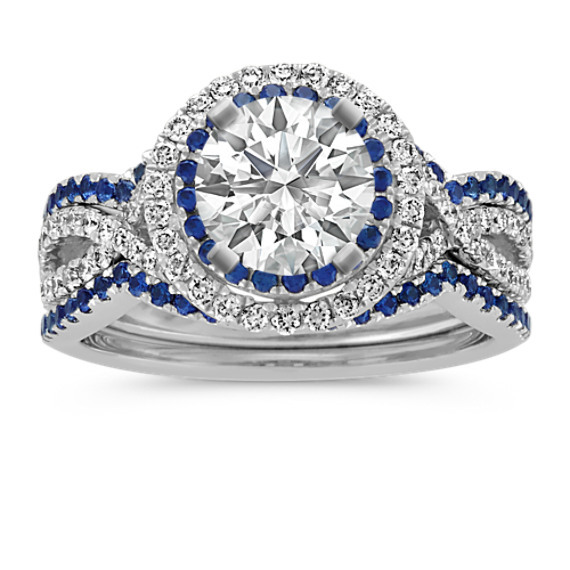 The infinity design is accented by 78 round traditional blue sapphires (approx. .48 carat TW) and by 92 round diamonds (approx. .49 carat TW). This wedding set is crafted of quality 14 karat white gold and has a total gem weight of approximately .97 carat.